Aunt Suzy says . . . In our ongoing 2015 series of soups and stews, we wanted to revisit one we make regularly and love. 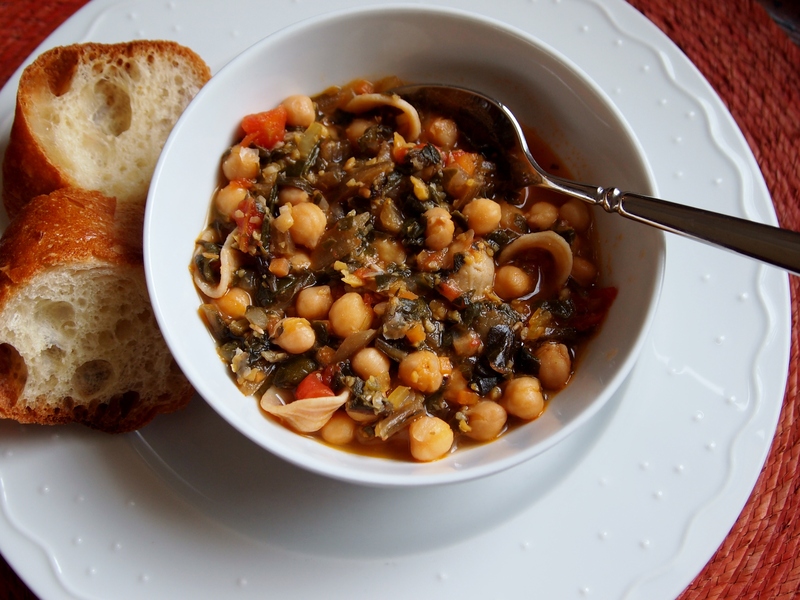 We did this recipe a couple of years ago which was a riff on today’s Cook’s Illustrated stew. This recipe is found in THE Cookbook, as my brother John calls it – The Science of Good Cooking from Cook’s Illustrated. It’s chock full of just what it promises, cooking science! The 2013 version used Italian sausage as the meat flavoring and cabbage as the vegetable. Today’s version uses pancetta and kale. While I liked both of these spins on the stew, I think the perfect combo will be sausage and kale. We will report back! Margaux says . . . I love this stew, and was excited to make this variation! 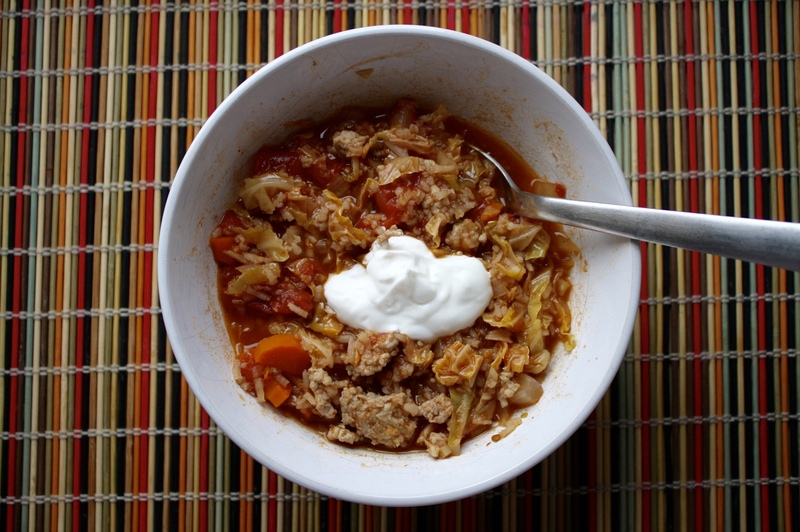 This stew is so hearty and delicious, I’ve made it with the sausage and cabbage several times. I agree with Aunt Suzy, though, that kale and sausage would be the perfect combo. I will definitely make it that way next time! I love serving this with a loaf of crusty sourdough and a green salad. Yum! Brining the beans: Dissolve 3 tablespoons salt in 4 quarts cold water in large bowl or container. Add beans and soak at room temperature for at least 8 hours and up to 24 hours. Alternatively if you’re in a hurry, bring the beans in the brining water to a boil. Turn off the heat and let stand for 1 hour. For both methods, when done soaking, drain and rinse well. Making the stew: Pre-heat oven to 250 degrees. Remove all racks except the bottom one. Heat oil and pancetta in large Dutch oven over medium heat. Cook, stirring occasionally, until pancetta is lightly browned and fat has rendered, 6 to 10 minutes. Add onion, celery, and carrots. Cook, stirring occasionally, until vegetables are softened and lightly browned, about 10 minutes. Stir in garlic and cook until fragrant, about 1 minute. Stir in broth, water, bay leaves, and soaked beans. Increase heat to high and bring to simmer. Cover pot, transfer to oven, and cook until beans are almost tender (very center of beans will still be firm), abut 45 minutes. Remove the pot from the oven and stir in the prepared greens and tomatoes. 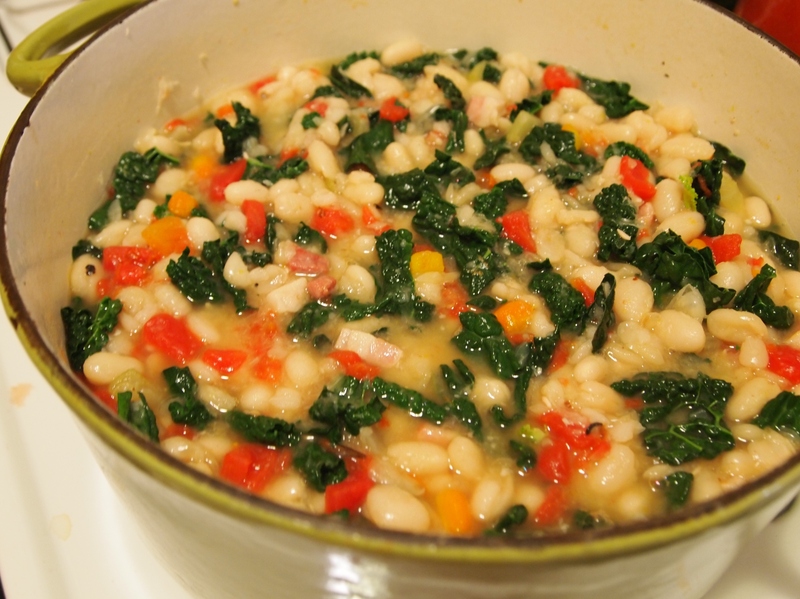 Cover pot, return to oven, and continue to cook until beans and greens are fully tender, 20 to 30 minutes longer. Remove pot from oven and submerge rosemary sprig in stew. Cover and let stand 15 minutes. Discard bay leaves and rosemary sprig and season stew with salt and pepper to taste. Serve over toasted bread, if desired, and drizzle with olive oil. Alternatively serve with a nice crusty baguette. It’s soup season and we love soups and stews here at S&SK! We’ve decided to do a Soup/Stew series this fall/winter season where we cook and blog about new recipes like this one and revisit old recipes to provide updates on some of our favorites. We just decided this late last week and voila! this recipe appeared in our Minneapolis paper in a regular column Sunday Supper. The Minneapolis contingent of S&SK loved this dish (slightly adapted in ingredients and method from the original), both with and without the sour cream. We served with a baguette and some dark beer. Randy and I both thought it would be really good with a sour dough bread as well. Jason and I loved this, too! The kids not as much, but since it was such a hit with Jason and me, I will try it again…I think the new flavors were what put the kids off, and sometimes we just need to try things a few times before they like it. The fun part about this was that my 6-year-old loves knowing what country our foods originate from, and we’ve never really had Hungarian food before, so he was really excited about this. We pulled out our world map and found where Hungary is, and then looked it up on the internet. We looked at pictures of Budapest, of the countryside, talked about traditions there, what music they listen to and different foods they eat. This is something I started last year when I was homeschooling him, and it has just become sort of the norm around here. His favorite so far is “Italian night,” which of course we do on a pretty regular basis. Sometimes we really “do it up” and make up a restaurant name, create a sign for our restaurant, put on music from that country while I’m cooking. It’s really fun! I also served this with a baguette…I’ve been making my own bread lately with a book Aunt Suzy got me, “Artisan Bread in Five Minutes a Day,” which I can’t recommend enough! 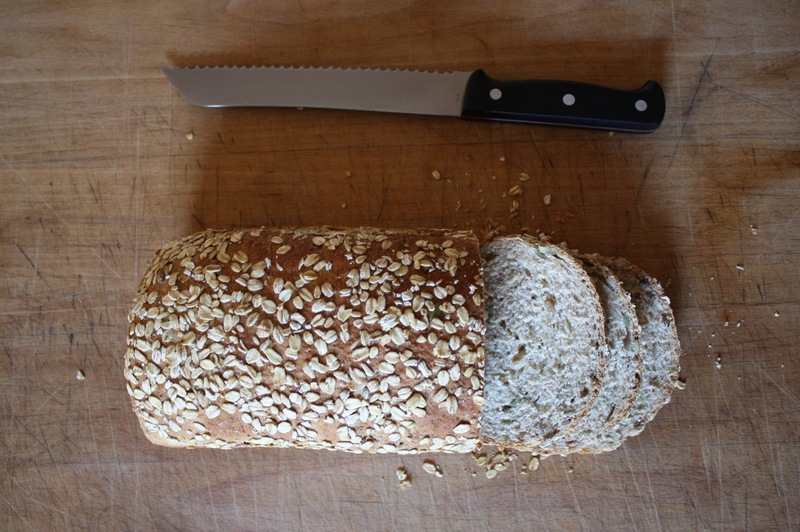 It makes bread making so easy, and the results are amazing. The baguette was sourdough, and it went perfectly with the stew. We had it with a cotes du Rhone, because it’s what we had on hand, and it was pretty good! Cook meat over medium-high heat in a large Dutch oven until no longer pink, about 5 minutes. Remove from pot, drain grease and wipe with a paper towel. Heat olive oil over medium heat and add onion, carrot and cabbage. Sprinkle with paprika, allspice and cayenne and stir to blend. 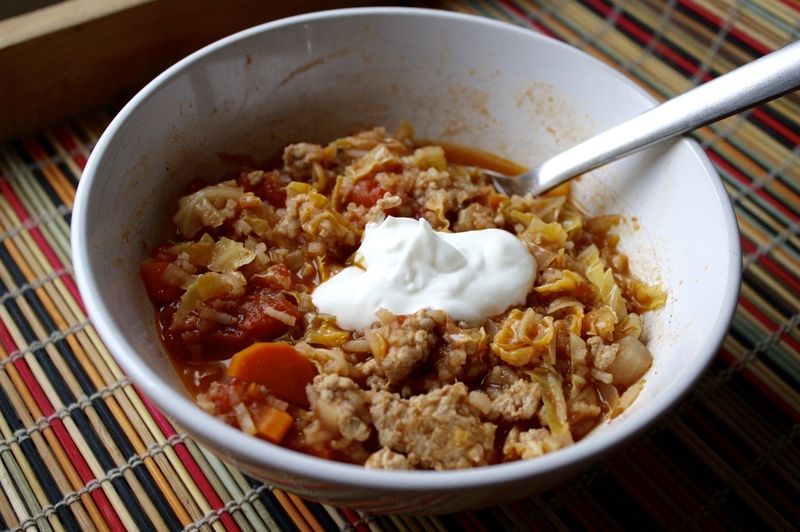 Add the browned meat back to the pot and cook, stirring, until cabbage is wilted, about 5 minutes. Add rice and season with salt and pepper. Cook, covered, until rice is just tender (it will cook more off the heat), about 15 minutes. 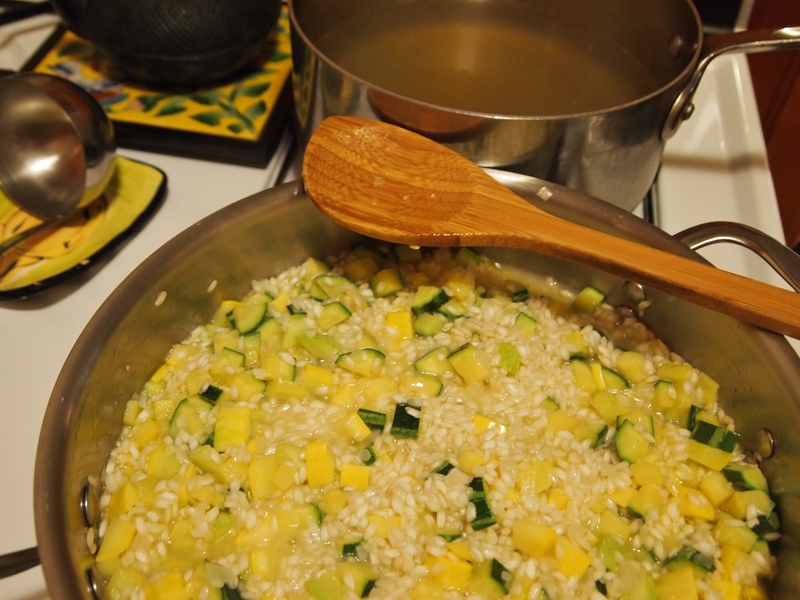 If using brown rice, put in when you add the stock, etc. Stir in dill. Serve in soup bowls with dollops of sour cream. I have one vegetarian in my family, so any time we have a dish with meat, I have to make a veg version. This one was really easy. Cook the stew according to directions, just eliminating the meat at the beginning (and using vegetable stock, of course). When you add the rice, also add one can (or two cups cooked) great northern beans. We thought the beans were a great addition to the stew! This time of year, when peaches are extra, super delicious at the farmer’s market (and those 4 lb boxes at Trader Joe’s! Yum!) my favorite breakfast is yogurt, granola and peaches. It’s really like a heavenly dessert for breakfast. Juicy, sweet peaches. Creamy, rich (whole milk, of course) yogurt. And crunchy granola, with tons of nuts and a hint of salty-sweet. I also have it for dessert sometimes, too (it’s great on ice cream!) And for a mid-day snack. We walk through one of those 4 lb boxes of peaches in about a half a week! 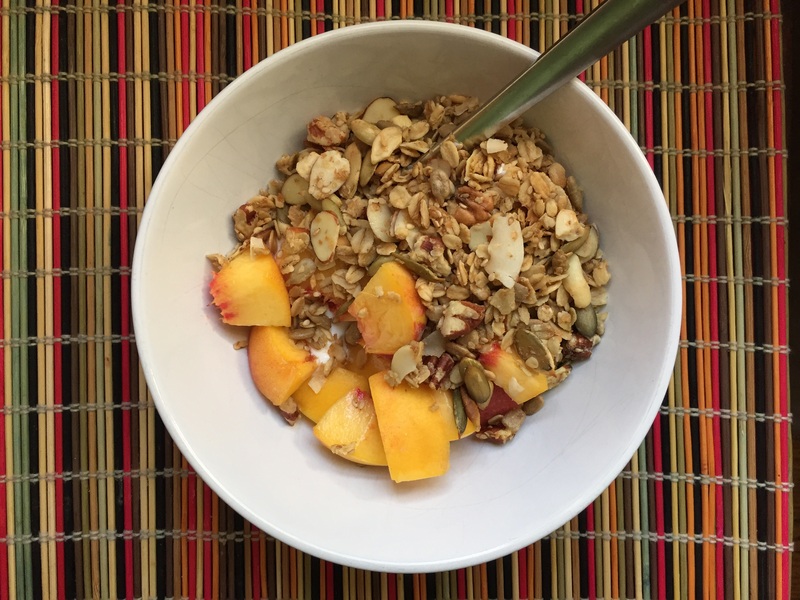 The granola is just as an important ingredient as the peaches. It can’t be too sweet, too chewy, or too hard. Supermarket granola, even the best kind, always has a weird aftertaste to me, almost like a coating is left in my mouth. I really don’t like it. Thankfully, making your own granola is really easy. I have two recipes that I use, both from my Aunt Judy. 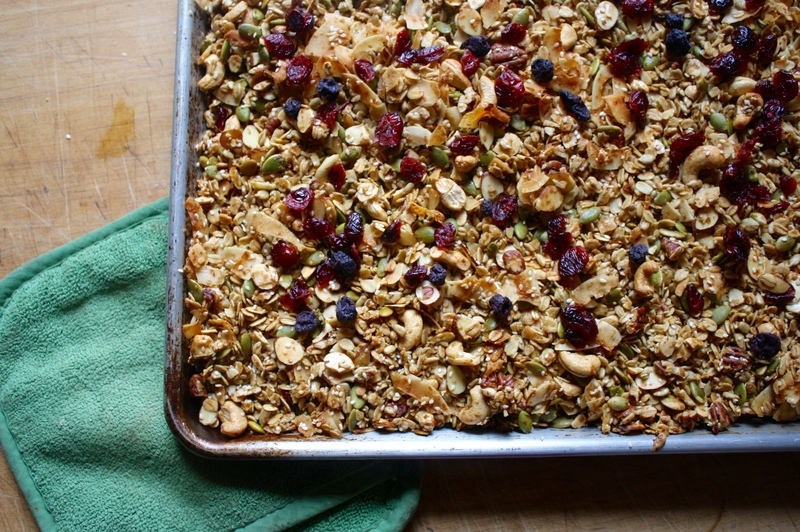 I’ve already posted one, the original “crunchy granola,” that I make on a regular basis. It’s very cheap, quick and easy. 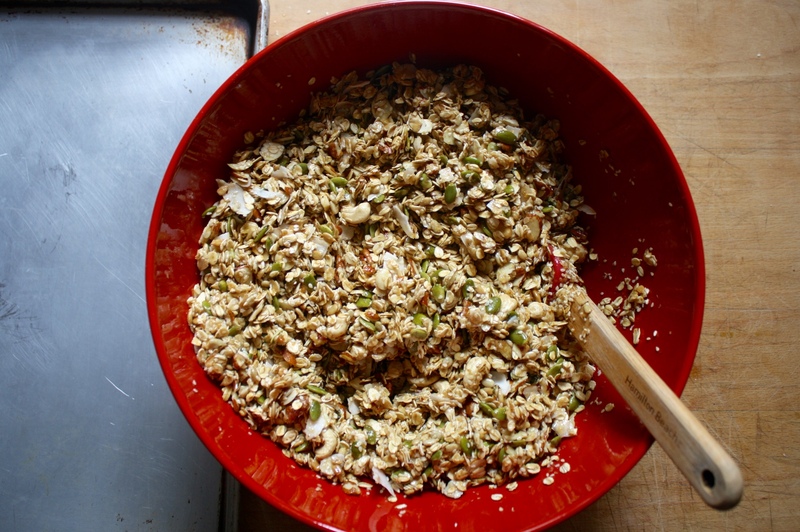 I also use this recipe, which Aunt Judy calls “Holiday Granola.” It has a few more ingredients (more nuts! ), and uses real maple syrup instead of honey and maple flavoring like the other one. My aunt makes it for friends and family members as Christmas gifts, which is how I first tasted it. It makes a perfect Christmas gift because of the pumpkin seeds (or pepitas) and dried cranberries: it’s red and green. I prefer it to the “Crunchy Granola” recipe, but don’t make it as often because it’s quite a bit more expensive. But it is totally worth it! * I’ve made this gluten-free by substituting flax meal for the wheat germ and had great results. **I leave out the dried fruit during the summer because I don’t want it competing with my delicious in-season fruits. Totally your call, though. Mix all dry ingredients in large bowl. Heat maple syrup, oil and salt together, stirring to dissolve salt. Pour over dry ingredients and mix well. Spread in large flat pan (I use a large baking sheet and it fits perfectly). Bake in oven for 45 minutes or more, until golden brown, stirring every 15 minutes. Sprinkle dried fruit over granola and allow to cool to room temperature. Store in airtight containers. Note: I have subbed all sorts of nuts for the ones suggested, just sticking to the same measurements. In this last batch I swapped half the pecans for cashews, and in the past I have used chopped walnuts in place of pecans, pistachios in place of pumpkin seeds and an additional 1/2 cup of sunflower seeds in place of sesame seeds. Just make sure all the nuts are raw and unsalted! I know, I know…why am I posting about something boring like tuna pasta salad? Where’s the cake? Cookies? Cupcakes? It’s end of summer harvest…where are the tomatoes? Zucchini? Sweet corn? Well, sometimes I have nothing in the pantry but a couple of cans of tuna, some pasta, some frozen peas and some parsley. When I desperately need to go grocery shopping, it’s likely that I have those things. 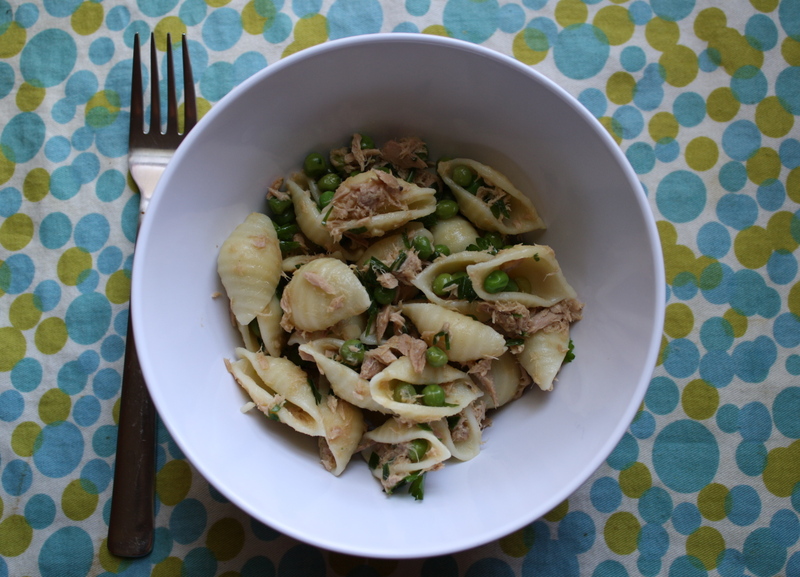 So I make this tuna pasta salad, a recipe from the Cook’s Illustrated 30-minute suppers magazine that I’ve vowed to post all of my favorite recipes from. And this is not your normal tuna pasta salad. It’s not mayonnaise-y or sweet. It has great flavor and a little bit of a bite from the lemon, garlic and Dijon mustard. I like to serve it on a bed of arugula, and if I have them on hand, with a handful of cherry tomatoes thrown in, too. The original recipe calls for toasted breadcrumbs on top, which I don’t love the texture of, but I’ll include the steps to that for those of you who would like it! 1. Bring 4 quarts water to a boil in a large pot. If doing bread crumbs, pulse bread in food processor until coarsely ground, about 6 pulses. Heat 1 tbsp oil in large skillet over medium heat. Add bread crumbs and 1/2 tsp salt and cook, stirring frequently, until deep golden brown, about 5 minutes. Transfer to bowl. 2. Whisk lemon juice, mustard, garlic, Worcestershire, 3/4 tsp salt, and 1/4 tsp pepper together in large bowl. Slowly whisk in remaining oil. Gently toss tuna with 1/4 cup dressing in separate bowl. 3. Meanwhile, add shells and 1 tbsp salt to boiling water and cook until almost al dente. Add peas to pot and cook additional 1 minute. Drain pasta and peas and rinse with cold water. Add pasta, peas and parsley to bowl with remaining dressing and toss to coat. Gently fold in tuna and season with salt and pepper. Serve, topping each portion with bread crumbs. Serve over a bed of arugula, or by itself with a green salad on the side. If you know us at S&SK, you know how much we love lemon. You can see all kinds of “lemony” recipes, both sweet and savory, on our blog. I predict this one will be a favorite up here in the Minnesota branch of our cooking team. 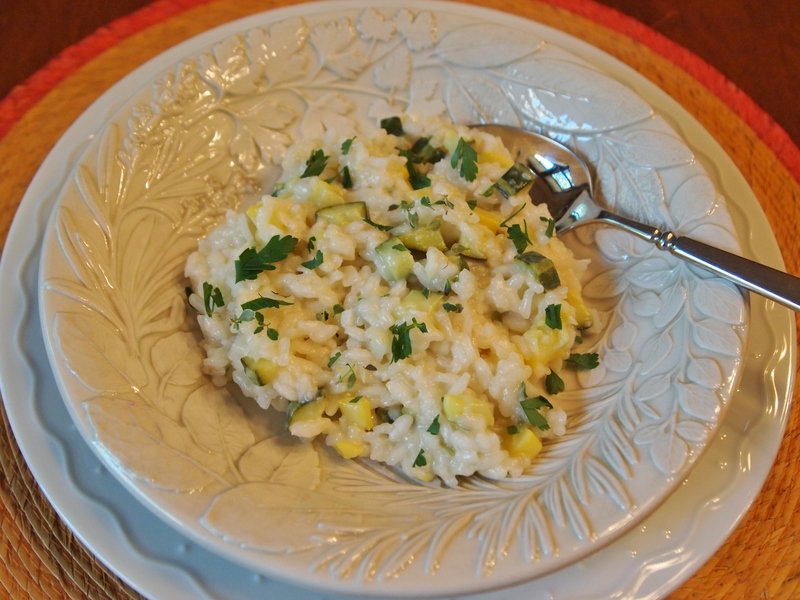 If you love risotto and love summery, lemony dishes, this one is a winner! Heat the stock in a pan and keep just below a simmer for use in the risotto. In a medium saute pan, heat the olive oil till it shimmers over medium heat and then add the onion and saute till translucent. Add the summer squash and a little salt. Turn up the heat and saute a further 5 min until the squash is just starting to get soft. Add in the rice and garlic and give a few stirs to coat with the olive oil and create the signature nuttiness of the rice in this dish. Add the wine and stir till absorbed. Turn down the heat and add about 1/2 cup of the hot stock. Keep at a low simmer, and stir until the stock is absorbed by the rice. Repeat by adding 1/2 cup stock at a time, stirring till absorbed until the rice is just about cooked through, about 25 minutes total. Add some more stock, the lemon zest and juice, the thyme and the Parmesan. Stir to blend. The dish should be creamy, not too dry and not too wet and the rice should be al dente. Best served in bowls with a refreshing glass of lemony Pinot Grigio. Notes on ingredients: Two medium squash added up to one pound for me with apologies for not measuring the amount of diced squash before adding it to the pan. I used one yellow squash and one striped zucchini. I used Pinot Grigio for the white wine, but a Sauvignon Blanc would work well too. Avoid anything with oak in it like a California Chardonnay. Use the best quality Parmesan that you can find for the flavor and creaminess that really makes this dish. We recommend grating it yourself vs. buying it already grated. Homemade pasta was on the menu for that night, which I got started on immediately after my haircut. I’d made it only once before, but it was pretty easy and seamless, so I thought it would be no problem to make starting at 3:30 pm. Ha. I mistakenly used a different recipe, and after 2 hours of work had to throw out the whole thing. Of course, I cried. And the kids, bored with TV and with me being in the kitchen, started going bonkers. I turned just in time to see my daughter playing in the bowl of flours that I was saving for the bread I wanted to start on again the next day. When my husband came home from work, I was at my wits end, and said I was never going in the kitchen again. Ok, end of rant. Here I am, the next day, making the bread. I can say it’s because I’m saving us money, but that would only be part of the truth (good bread is expensive!). But it’s mostly because it’s been a month since I made this last, and I have been dreaming about it. I don’t think I can eat another supermarket loaf again, at least not for awhile. This bread is amazing. It takes my family about 4 days to walk through two loaves. I wouldn’t say it’s SUPER easy to make, but so worth it. 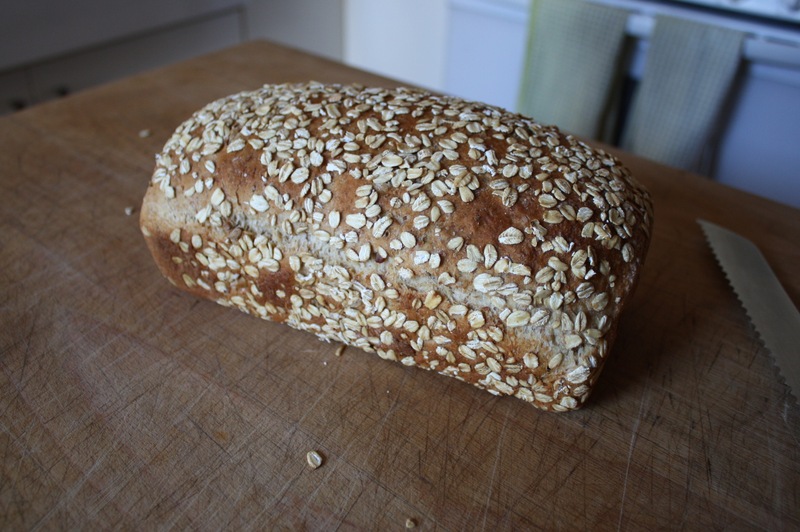 This winter, when we didn’t have much to do but sit around and read and play games and make food, I kept us stocked with this bread. 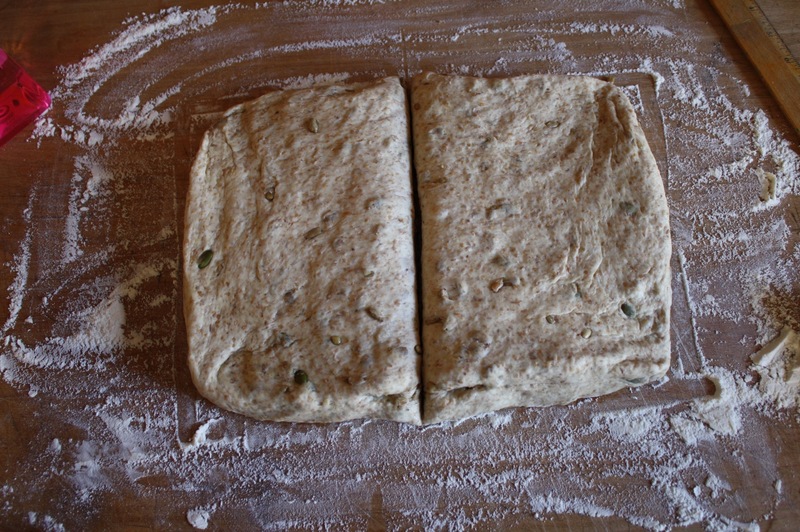 So, here I am, back in the kitchen, making this bread, while my crazy daughter is doing who-knows-what. This time I will at least make sure I have the honey, and that she keeps her hands out of the flour. 3. Adjust oven rack to middle position; heat oven to 375 degrees. Spray two 9×5-inch loaf pans with nonstick cooking spray. 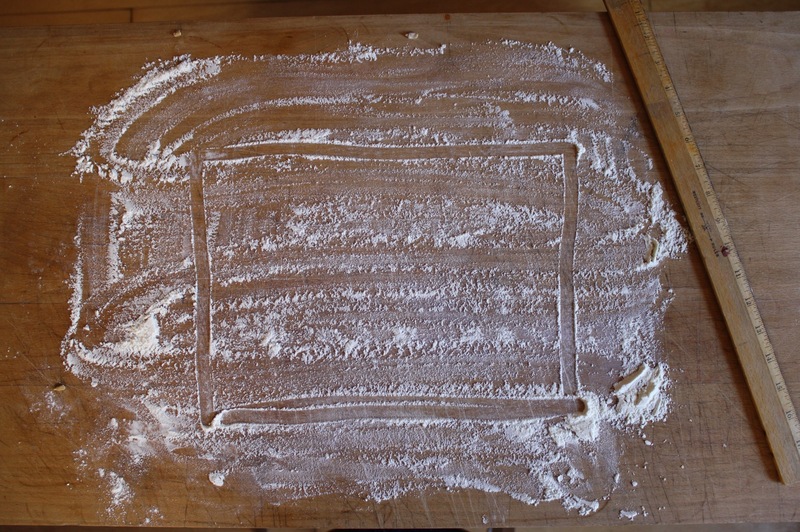 Transfer dough to lightly floured work surface and pant into 12×9-inch rectangle ****(see note below); cut dough in half crosswise with knife or bench scraper. 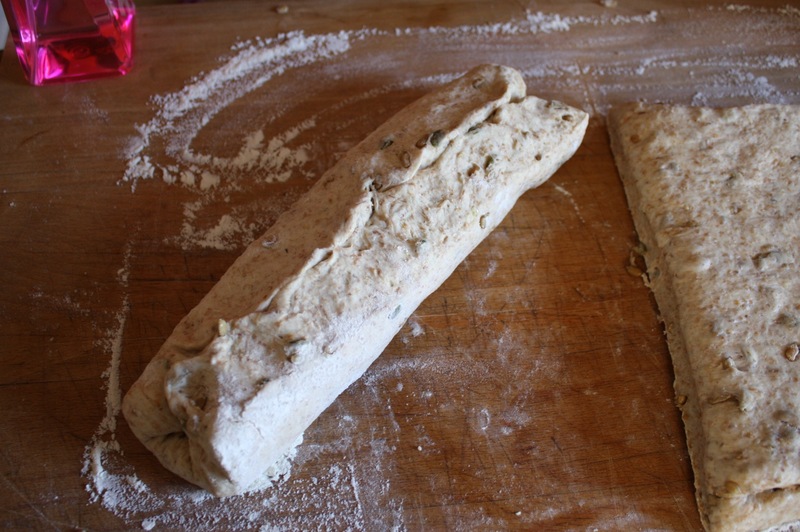 With short side facing you, starting at farthest end, roll one dough piece into a log. Pinch seam together gently. 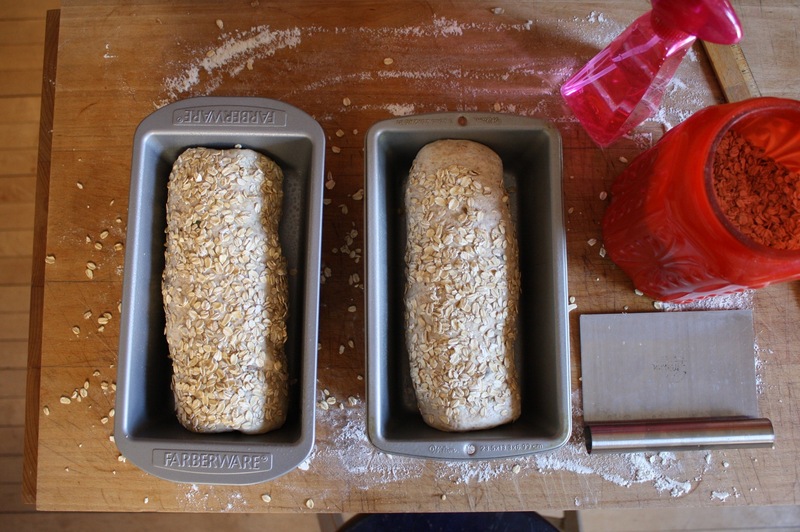 Spritz with water all over, then roll in the oats so that they completely cover the loaf. Drop loaf into prepared pan, then repeat process for second loaf. 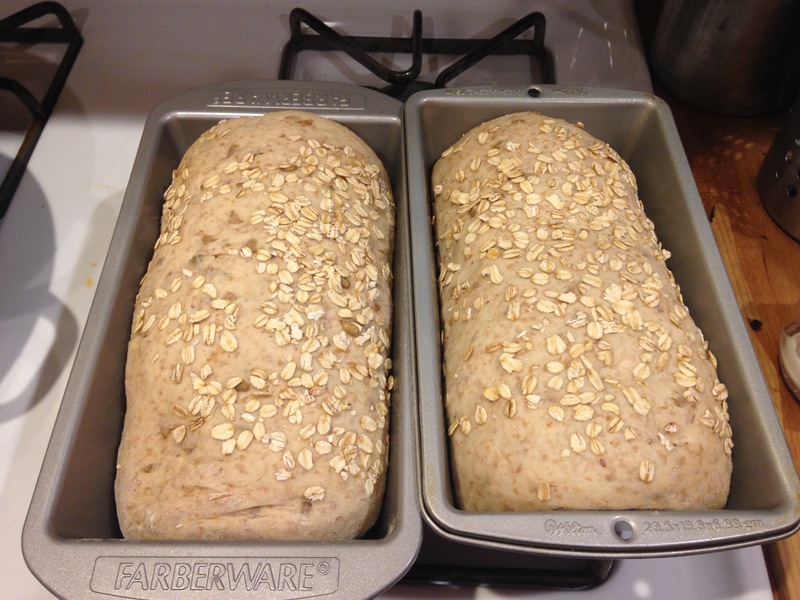 Cover loaves lightly with plastic wrap and let rise until almost doubled in size, 30 to 40 minutes (in the winter, when my kitchen is chilly, I rise the loaves on my stovetop while the oven is preheating). 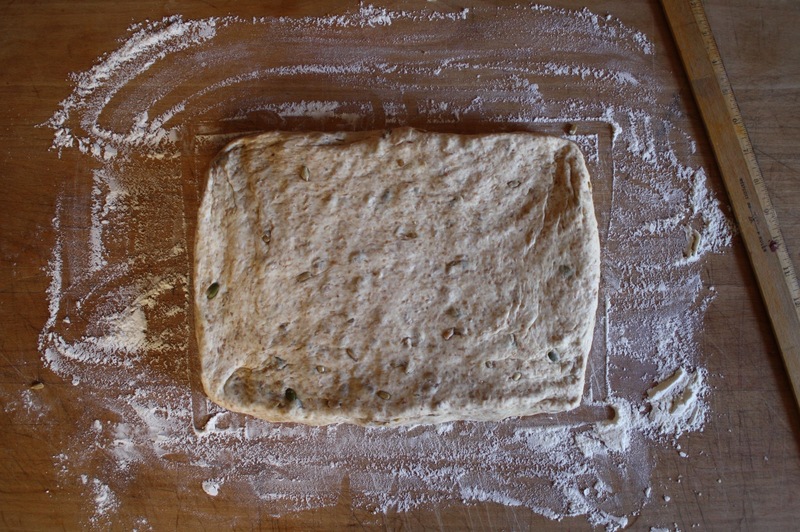 Dough should barely spring back when poked with your knuckle when it is ready to go in the oven. Bake until internal temperature registers 200 degrees on an instant-read thermometer, 35-40 minutes. (I start checking at 30 minutes). Remove loaves from pans and cool on wire rack before slicing, about 3 hours. This bread is called easy, and it is. The 7-grain cereal replaces a whole bunch of different flours, so the ingredient list is pretty minimal for a multigrain bread. 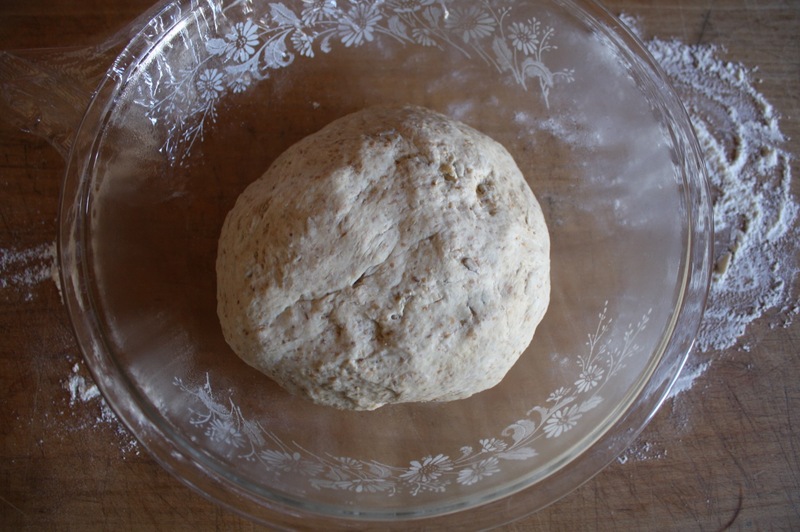 I’ve never been much of a bread-baker; baking with yeast seemed daunting to me. 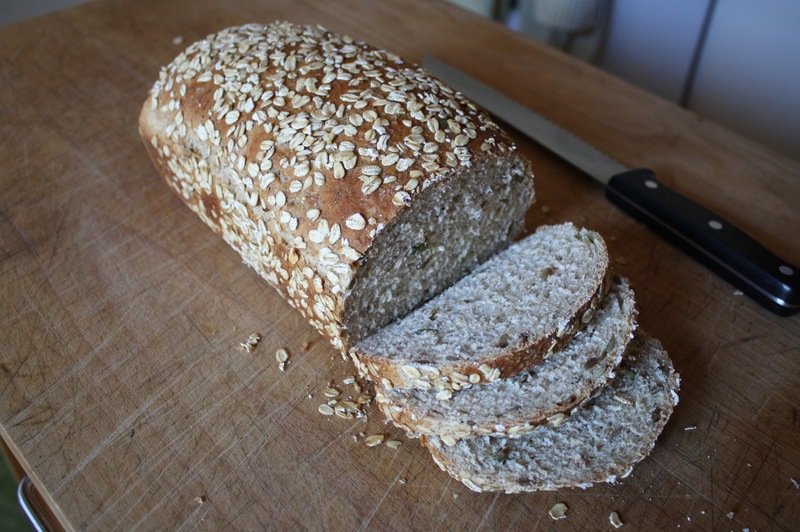 This was one of the first bread recipes I ever tried, and it turned out great the first time! However, it is time consuming. It takes almost 4 hours to make this, from start to finish, including resting and rising times. The nice part is that you can get the hot cereal mix going, and get all your other ingredients ready while it’s cooling. But for me, the rest and rise times just aren’t quite long enough for me to go anywhere, so it has to be made on a day that I’ll be sticking around the house. *Vegan options: For the butter, you can probably substitute Earth Balance, but my trusted vegan source says that what’s way way better is making your own vegan butter from scratch. She uses this recipe. For the honey, my source recommends “Honee”, which is a vegan honey substitute made from apples and lemon. Agave syrup would probably be too sweet, and I think maple syrup is too strong of a flavor, although if you can’t find Honee and don’t want to order on Amazon, maple syrup is probably your best bet. 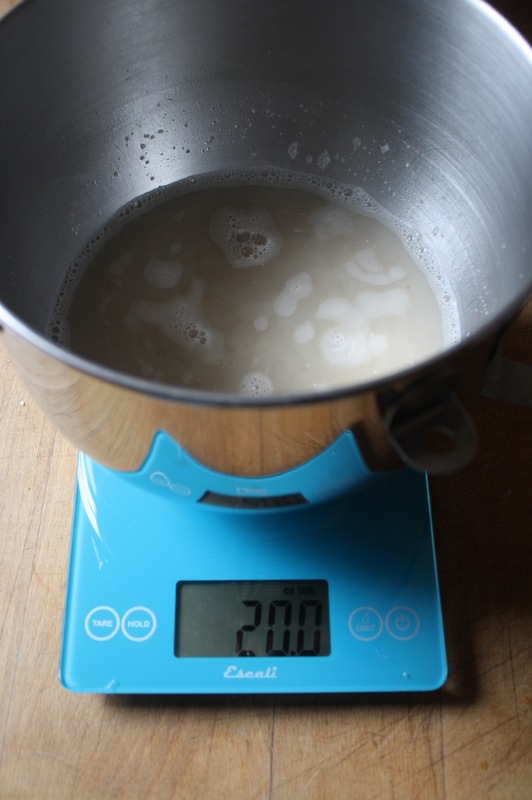 **Having a digital kitchen scale is so very helpful when baking. I just started doing this, and wish I would have started years ago! It’s a more accurate way to measure flour and other dry ingredients, and it is super fast and easy. I just put my bowl on the scale, hit “tare”, add the first ingredient, then hit “tare” again, and add the next ingredient. “Tare” clears the scale, so you are weighing just what you’re putting in after pushing it. I recommended a scale above, but you can find ones even cheaper on Amazon that get good reviews. 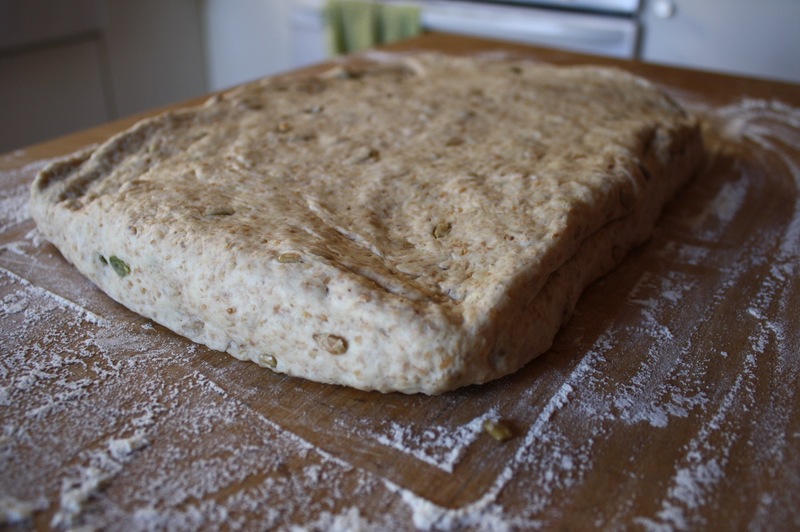 ****Today while baking the bread, I ended up running out of time before it would be ready to go in the oven, so I tried slowing down the final rise process by putting the prepared loaves in the refrigerator. They ended up still really great, so if you are short on time for some reason, I recommend putting your prepared loaves in the fridge until you can bake them. I’m not sure exactly how long you can do this for…the recommended rise time for the loaves is 35-40 minutes at room temperature. I put them in the fridge right after preparing them, and took them out to bake about 3.5 hours later and they had doubled in size in the fridge. I let them get back to room temperature (set them on the stovetop while the oven preheated) before baking. I don’t think you could let them sit in the fridge for much longer than that since they doubled already in that amount of time…definitely not overnight. But this is a quick fix if you somehow run short on time and need to come back to it later! This winter, Randy and I had what we called “Downton Abbey Dinner Date”. We would record DA and I would cook a soup which we would have while we watched the latest installment, usually Wednesday evenings. It was a lot of fun and great to have warming soups during our coldest months. While I made a few standbys, I tried some new recipes including this one. Margaux had pinned this recipe a while back and while searching for something to cook it caught my eye. I thought it looked really good and that it would be a really quick weeknight meal. We made a number of adaptations to up the deliciousness, but still keeping fast and easy in mind. How quickly you can make this is determined by how much you cook from scratch (chickpeas, e.g.) or how much you use canned/frozen ingredients. I don’t remember pinning this recipe, but I’m really glad Aunt Suzy brought it to my attention! I just made it last night and it was a hit with the whole family. My son loved that it was spicy, too…he’s very proud that he has a taste for spicy food. If you have someone in your family that is sensitive to spicy things, I would cut the red pepper flakes back to 1/4 tsp. I used fresh chard because I couldn’t find frozen in my grocery store, but I think using frozen is a great idea as a time saver, and I’ll be keeping my eyes out for frozen for the next time I make this. If using dried chickpeas, cook according to directions. 2 cups dried will produce the amount of cooked called for in this recipe. If using canned, drain and rinse. Combine 1 1/2 cups cooked chickpeas and 1 cup chicken stock. 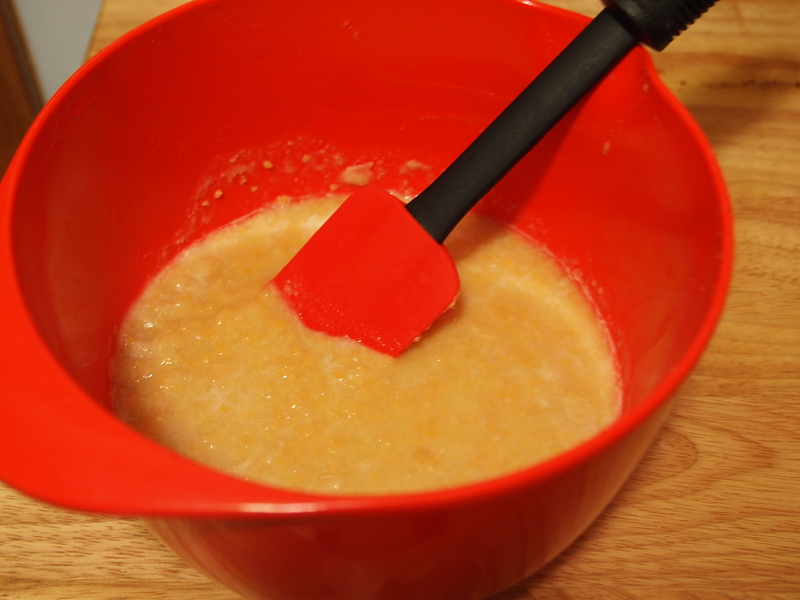 Using a hand or regular blender, process until the texture is like oatmeal. Set aside. Heat the olive oil in a Dutch oven or soup pot. Add the onion, carrot, celery, chard stems, if using, and rosemary. Saute over medium heat for 5 or so minutes until softened. Add the garlic and cook until fragrant, 1-2 minutes. Add the tomatoes and their juices and the pepper flakes. Stir for a couple of minutes. Add the pureed chickpea mixture, the remaining chicken stock, cooked chickpeas, bay leaf and the Parmesan rind, if using. The amount of stock you will use depends on whether you like your soups on the thick or thin side. Bring to a boil, turn down heat and simmer for 30 minutes. Add the Swiss chard and cook for another 10-15 minutes until cooked but not mushy. Remove the Parmesan rind and bay leaves before serving. Meanwhile, cook the pasta according to directions until al dente. To serve, place a little pasta in the bottom of the soup bowls and ladle the soup into the bowl. Serve with baguette if desired.